This page is about the Scottish region. For other uses, see Argyll (disambiguation). Argyll (/ɑːrˈɡaɪl/), archaically Argyle (Earra-Ghàidheal in modern Gaelic pronounced [ˈaːr̴əɣɛː.əɫ̪]), is an ancient shire of western Scotland. Its area corresponds with most of the modern council area of Argyll and Bute, excluding the island of Bute and the Helensburgh area, but including the Morvern and Ardnamurchan areas of the Highland council area. At present, Argyll (sometimes anglicised as Argyllshire) is one of the registration counties of Scotland. Argyll is of ancient origin, and corresponds to most of the ancient kingdom of Dál Riata. Argyll was also a medieval bishopric with its cathedral at Lismore, as well as an early modern earldom and dukedom, the Dukedom of Argyll. Between 1890 and 1975, Argyll was a county with a county council. The name derives from Old Gaelic airer Goídel (border region of the Gaels). The early thirteenth-century author of De Situ Albanie explains that "the name Arregathel means margin (i.e., border region) of the Scots or Irish, because all Scots and Irish are generally called Gattheli (i.e. Gaels), from their ancient warleader known as Gaithelglas." The first record of Argyll as a shire dates from 1326, when a sheriff was appointed. At that time the shire covered a much larger area than the later county. It included the islands which later formed Buteshire, which became a separate shire by 1388, when a heritable sheriff was appointed. It also included the area of Ross-shire, which was separated from Argyll by an act of 1503. 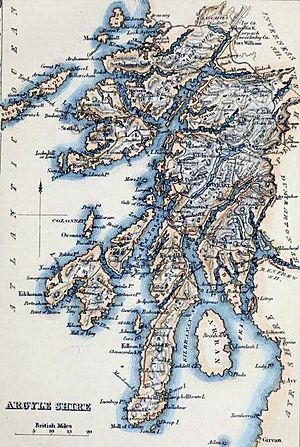 The heritable sheriffdom of Argyll was abolished by the Heritable Jurisdictions (Scotland) Act 1746, and the governance of Scottish shires was brought into line with that of counties in the rest of Great Britain. Between 1890 and 1975, Argyll had a county council. Argyll's neighbouring counties were Inverness-shire, Perthshire, Dunbartonshire, Renfrewshire, Ayrshire and Bute. Renfrewshire and Ayrshire are on the other side of the Firth of Clyde. Bute is a county of islands in the firth. The county town of Argyll was historically Inveraray, which is still the seat of the Duke of Argyll. Lochgilphead later claimed to be the county town, as the seat of local government for the county from the 19th century. Neither town was the largest settlement geographically, nor in terms of population, however. Argyll's largest towns were (and are) Oban, Dunoon and Campbeltown. The use of the County of Argyll for local government purposes ceased in 1975 with its area being split between Highland and Strathclyde Regions. A local government district called Argyll and Bute was formed in the Strathclyde region, including most of Argyll and the Isle of Bute. The Ardnamurchan, Ardgour, Ballachulish, Duror, Glencoe, Kinlochleven and Morvern areas of Argyll were detached to become parts of Lochaber District, in Highland. They remained in Highland following the 1996 revision. There was an Argyllshire constituency of the Parliament of Great Britain from 1708 to 1801 and of the Parliament of the United Kingdom from 1801 to 1983 (renamed Argyll in 1950). The Argyll and Bute constituency was created when the Argyll constituency was abolished. Clan Lamont historically both allied and feuded with the Campbell clan, culminating in the Dunoon Massacre. In the 19th century, the clan chief sold his lands and relocated to Australia, where the current chief lives. The highlands above the village of Lochgoilhead were used for a scene in the 1963 film From Russia with Love, starring Sean Connery as James Bond. He killed two villains in a helicopter by firing gunshots at them. The 1985 Scottish movie Restless Natives also used Lochgoilhead to film a chase scene, as well as some roads just outside the village. The housekeeper Elsie Hughes in Julian Fellowes' television drama Downton Abbey is from Argyll. Argyll Facts for Kids. Kiddle Encyclopedia.